I have a 16 week old sable GSD male who is AKC registered, and have joined the German Shepherd Dog Club of America and the German Shepherd Dog club of America - WDA. Are there any other clubs that I should affiliate with? I want to title him not only in AKC tracking and obedience but want to title him with BH, AD and see where else both of us will go in obedience. What a gorgeous baby. I would definitely check into other sports like agility and Schutzhund to start. And if that goes well, then there are always other dog sports for you both to compete in too. Please send in some pictures of you two competing if you can and I'll add them to the site. Good luck. Comments for What clubs do I need to join if I have a working GSD? 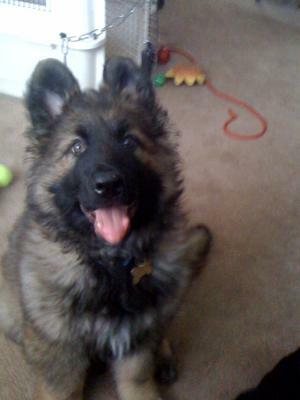 I think my frustration is that I haven't been able to find a schutzhund club near me and Max. I am a new member of GSDCA and GSDCA-WDA and they don't have a local club near me. I am a member of the WV K-9 SAR group and will work him in tracking. It's just frustrating to be in a geographic region with so few opportunities for my dog and I.